I am so delighted to say that I belong to a group of enthusiastic embroiderers who meet once every month to laugh, share and learn from each other. According to Oprah (and Goldie Hawn who was her guest that day), if you attend and participate in a monthly club/group with a common interest, your over all happiness increases for your whole life. They stated that the happiness was equal to a significant increase in pay. You can take the 'Happiness Test' yourself. What does this have to do with embroidery? I think a lot! We do a project and think it is 'flawed' in some way but we are proud to share the item with others who appreciate the 'behind the scenes' activity that they know occurred in the creation effort. So, just for your information and consideration, let's talk about that project. When I am at that group meeting, people are asked to share their projects and we all do - proudly. However, I often hear the owner of the project start off by saying something like - - - "Don't mind the mistakes. . . " or "I had trouble with the . . . " or even "This is my first try at . . . "
What is it that they are saying? They are saying something that is akin to "I did not do this perfectly but I really want to share them with you." 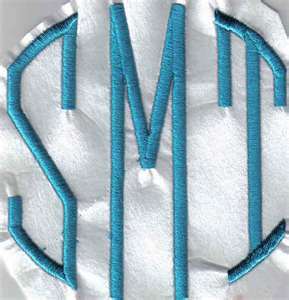 If the group were not embroiderers, the likelihood that anyone would even spot the error is miniscule. Even the knowledgeable ones don't mind the imperfections, we want to see what others are doing. We want to see that, while no one is perfect, we just enjoy our craft! Here are a few of my recent items that have errors on them. Try to spot the error and then I will describe the issue after the photos. Don't look at the explaination until you have reviewed the photos, it will be fun for you to see my work that I judged to be OK, but with room for improvement! Both items were created for clients and were sent to them. So, they were not total failures, just lacking the perfection I wish I could create. The next item was one that I was trying for the very first time. I did not do a 'discovery' sew (to see what I might need to have it be up to my standards) and I could have done a whole lot better. The next photos are not my projects, but you may be able to see some 'interesting results' on these as well. This is NOT to expose others, it is just to show that we are all subject to things that could be a bit better. 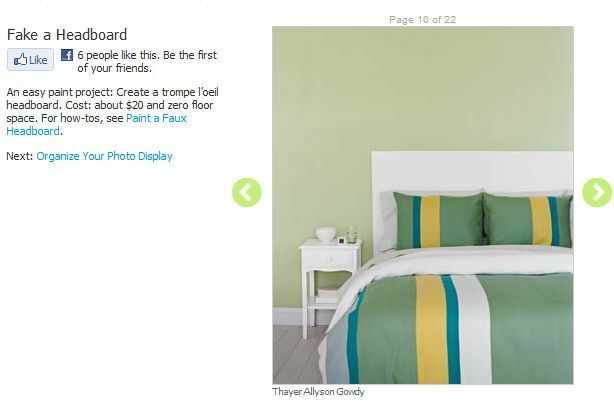 This is a 'painted on' headboard, but the interesting thing (to me) is that the lines of the bedcover and the pillowcases don't match. It is from a well known magazine. If it is good enough for them, it is good enough for me. This one is an obvious stabilizer problem. Again, it is on the Net and posted proudly. YES!!! OK, now for the issues with my projects. 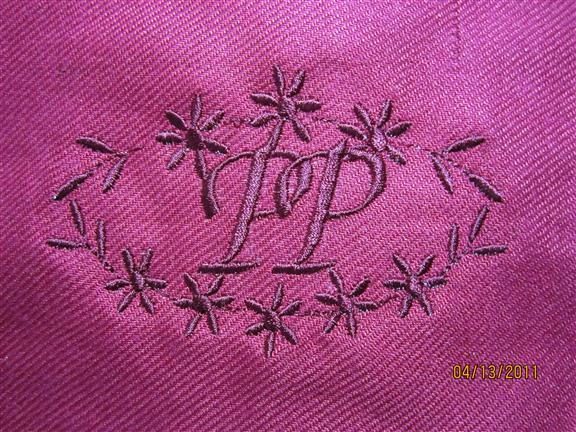 The first photo shows a monogram that was created from a design that had just one "P" and the buyer wanted two "P's." With the software I had available, I could not erase the original "P" then add the two. I just don't have the capability. So, as the design was sewing out, I skipped the original letter and then added the two letters by guessing where they should go. I meant to have them separate, but I liked the outcome of them being interlinked. It was a mistake but a good one. My second photo shows a more complex failure. I did not have time to play with it and I had a lot of problems. The first of which was that I was unaware that the top area, the leaves and flowers, was quite dense. 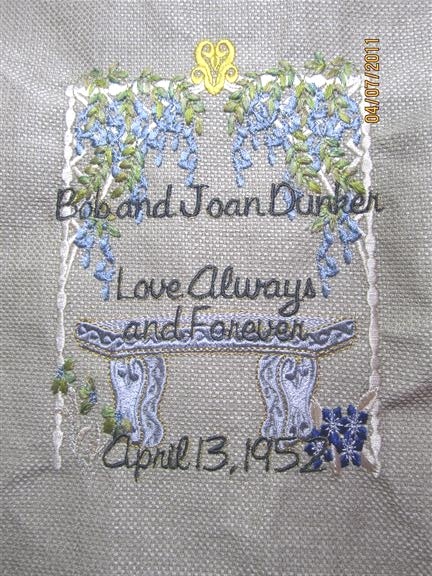 I even had problems with my machine trying to go through the 'bullet proof' stitching. That entire issue lead to my error of understabilizing the whole project. I would have used two layers. Directly on the fabric I would have used Ann's Adhesive Stabilizer and then a Heavy Cutaway Stabilizer behind that. Instead I had to work out the wrinkles, glue the project to a piece of cardboard and then iron it to make sure it still looked nice. A LOT OF WORK that could have been avoided. 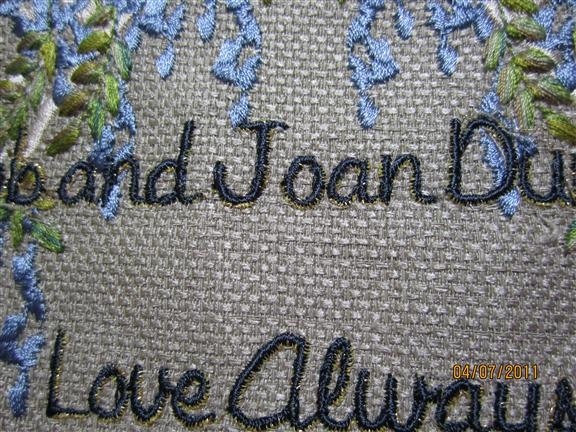 Additionally, the next photo shows the wording with just a little hint of gold thread. I wanted to do the words in gold but found it was just not showing well. So, I had to redo the words in black and hence there is a little bit of the old thread showing. That added a little bling without being overly flashy. So, the moral of the story is to use the correct items the first time AND some small imperfections make your project uniquely YOURS. I just got my Designs in Machine Embroidery Magazine and gotta go and read, read and then enjoy looking at all the photos!!! Check out their Free Designs too. I will be making notes on the pages as well. See my blog on magazines - what a JOY they are!